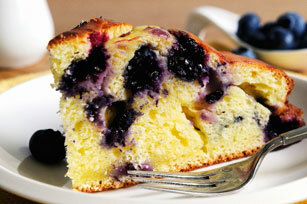 This luscious blueberry and ricotta cake includes a citrusy twist, thanks to the addition of lemon flavour JELL-O Jelly Powder in the baking mix. Mix baking mix, dry jelly powder and sugar. Whisk ricotta, eggs and lemon zest in large bowl. Add dry ingredients; stir just until moistened. Stir in blueberries. Bake 35 min. or until toothpick inserted in centre comes out clean. Use raspberries instead of blueberries.